Surprise! There’s no After MaRo today. Ask me why? Because, it actually deals with what he was talking about with a new keyword ability: Evoke. Here is what MaRo first came up with when he (so he claims) came with up with the idea of Evoke (called animate). After rules problems, it was changed to what it looks like today. After I saw Evoke, I knew that there was similarities, but it wasn’t until yesterday when I saw how close Evoke was/is to Aggression. There are differences (as mine were still creatures, but acted like spells) but it begs the question: can I still develop Aggression as a keyword since Wizards (Offically) put out Evoke? Editor’s Note: Yes, I know that Wizards didn’t steal my idea. It’s just how a person feels after they see something like what they’ve been working on gets made for real. Plus, it makes for an interesting title. Aggression, from a flavor aspect, was a penalty you paid for getting something now instead of waiting for it later. The story that Aggression could be used with is that these creatures were so passionate, they were going to give their all earlier, so they died out sooner (at the end of the turn). Enchantments and Artifacts were made out of powerful magic and materials that they faded quickly. Towns were quickly built without much thought if they were going to be up tomorrow or not. That could work for Aggression’s flavor (for those that like the story aspect of Magic; I don’t know how Evoke works in the story). Here’s some Aggression creatures I made, and tell me if it doesn’t sound similar to Evoke. This is to get a feel of what the keyword was going to look like. When ~this~ comes into play, counter target spell. When ~this~ goes to the graveyard from play, target player sacrifices a creature. T: Add two mana of any color combination to your mana pool. Aggression – Sacrifice a land. When ~this~ comes into play, destroy target nonartifact, nonblack creature. It’s a more costly Nekrataal but a bigger body and with Fear instead of First Strike. Now, when you add the Evoke cost, you add the static ability: you can pay the Evoke cost of 1B instead of paying 4B. 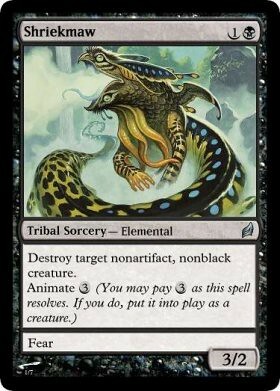 Sure, you can lose a creature, but you can get rid of that pesky creature 3 turns faster. The biggest difference is in that upper right hand corner. Yes, now a days, casting cost means everything, even when you’re not actually paying that all the time. Let’s take a look at who benefits from either Aggression or Evoke. As you can see, both of these two mechanics would fit into different type of decks. And, I’m sure that members of R&D had these same discussions as well, since the first incarnation of Evoke appeared almost like my Aggression: you pay a cheap cost to get an effect, and a larger one to “keep” (or make it become in Evoke’s sense) the creature. But, as we will learn, you don’t develop in a bubble. There’s one (main) reason why (I believe) they made Evoke the way they did, and it’s that keyword, Clash. In this block, it’s good to have a larger casting cost if you want to have a benefit of Clash, so Evoke as it is now, was made. But back to that question I asked up top: Do I stop working on Aggression cards? Is evoke too similar? At the moment, yes. They are along the same lines trying to do the same thing, have creatures that act like spells. Sure, Aggression has more design space (having creatures be like Ball Lightning and extending it out to other permanents), but I’ll wait until Lorwyn block is complete and see what they do with the mechanic. At the moment, they’re all come into play creatures, and in Morningtide, it might be, “when ~this~ goes to the graveyard from play” creatures. If after the block, I feel that Evoke and Aggression can live together in peace, and I extend it to something that Evoke didn’t cover, I’ll create more Aggression cards. Because with only so many cards that they can put into the set, there is still something that they missed. I’m sure that some of you have had this problem as well, and I would love to hear your thoughts on this. What kinds of keywords did Wizards “Steal” from you. Did you feel angry, proud, indifferent? Sound off down below. Isn’t aggression really similar to kicker? As an ability, it kind of falls into that sort of trap. (as do most keywords anyhow) Granted, Evoke behaves like a split card. Creating new and doing twists on Keywords will be discussed on future Design Classes. I was merely talking about this now since MaRo talked about this on Monday, and it looks a little templated like my mechanic. At the moment, just continue what you’re doing and we can take a look at it later. Plus, I don’t think MaRo liked me calling him every week; so to prevent a restraining order, I stopped calling him for this week. Man, ‘Wonderful Multi Land’ is Bah-roken!!! a banned card that, according to MaRo, he always wanted to re-make. thus avoided being banned again.